Mutton Snapper are found from New England to South America but are most concentrated in South Florida and parts of the Caribbean. They sometimes are found in groups but are not really a schooling fish, with larger ones tending to be more solitary as is the case with many fish. They are found in a variety of places from inshore estuaries to offshore reefs down to a couple hundred feet. They are one of the wiliest Snappers and can be difficult to fool especially on artificial lures. When hooked, they put up a strong fight with many strong runs towards rocks. They range from a couple pounds to a little more than 20lbs. A fish in the teens is a good sized fish. They bite well at night, especially around a full moon. 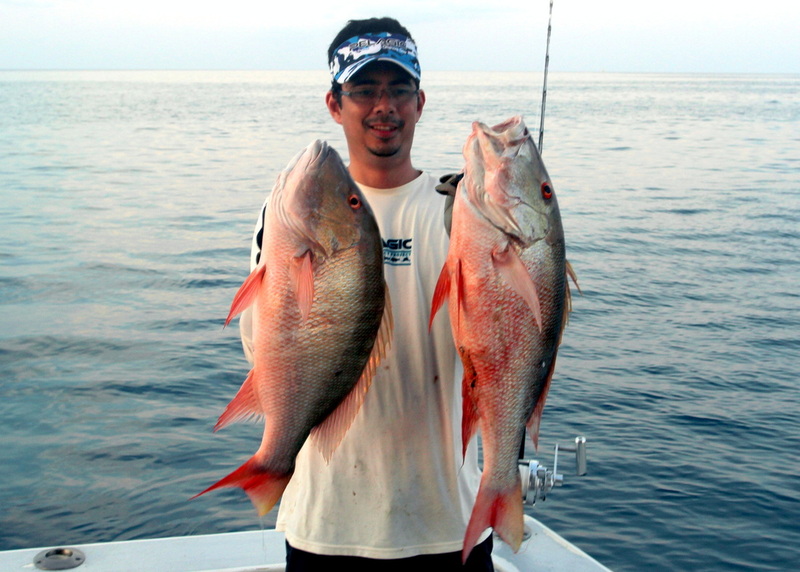 Mutton Snapper feed on small fish, crustaceans, and mollusks. They are very good eating. I would recommend a medium weight saltwater conventional setup rated 15-20lbs or so, maybe heavier if you are targeting the big ones. You could also use saltwater spinning gear. 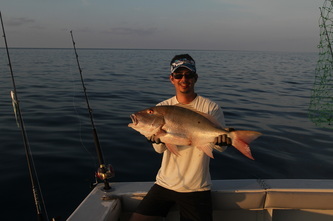 If fishing for them in nearshore estuaries then downsize your tackle. 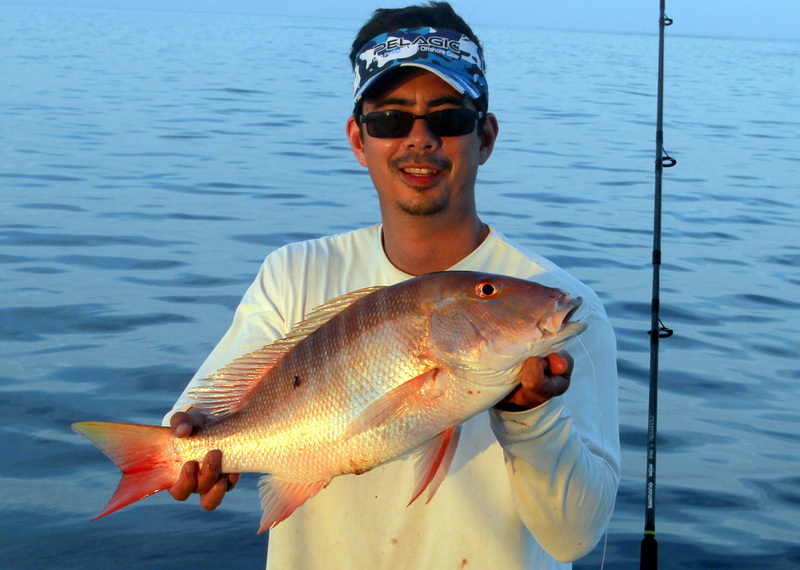 Mutton Snapper are very smart, especially in heavily fished areas, so it is adviseable to use a long leader that is as light as you feel you can get away with and not to use extra snaps or swivels or other gear. Wire leaders will severely limit the number of bites you get so they are not recommended. Mullet Snapper can be caught casting lures or bait in very shallow water near rockpiles near shore or bottom fishing farther offshore with bait or jigs. Chum can help bring them up off the bottom and nearer to the boat. 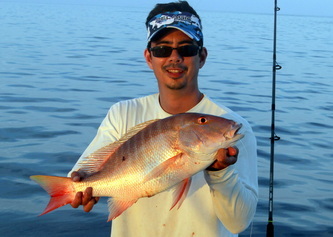 Mutton Snapper are tough to catch on lures and in the interest of full disclosure I have never caught one on a lure. From what I have heard they can be caught on bucktail jigs fished near the bottom and tipped with squid, shrimp, or ballyhoo. Metal jigs can sometimes work if you really know how to work them. Live baits such as pinfish or goggle eyes work well. Fish them near the bottom. Dead baits such as ballyhoo, shrimp, or squid can also work well. Either fish them on the bottom or flyline them back in the chum slick. The Dry Tortugas islands in Florida receive light fishing pressure and are one of the best spots to target these.